It’s October! 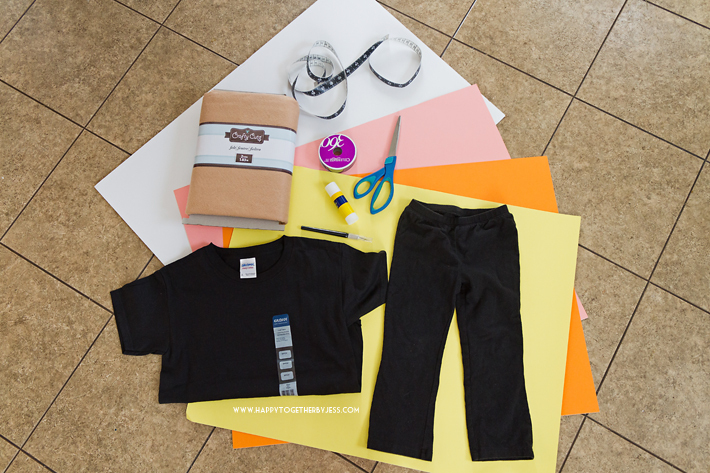 Fall is here for some and costumes are on the mind, so it makes sense that our Michaels Makers Challenge was to do a costume diy. 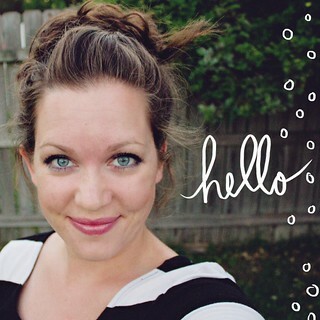 I wanted to do something different that would take minimal time and money. Somehow a popsicle came to mind. Maybe because we are still having some hot days and it feels like summer? Maybe. Good news is that it did end up being different, took little time to make, and didn’t cost a whole lot either. You might already have many of the supplies needed to make this. 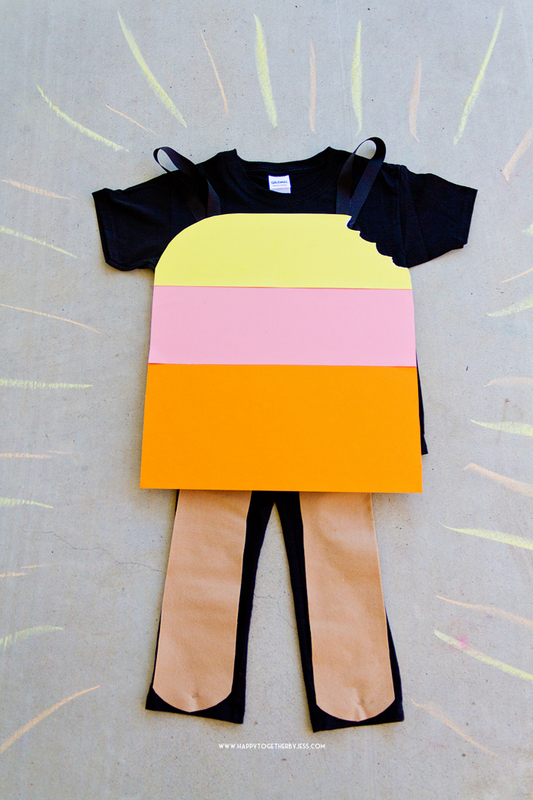 Start by cutting out 2 popsicle stick shapes from felt. I ended up making mine a little less wide than pictured above after trying it on my daughter. Then I simply safety pinned the bottom of the felt stick to the bottom of the pants front. And then safety pinned it to the top of the pants. You could make this more permanent if you like by sewing or gluing them in place, but I wanted to let the pants stay useable year round. Measure to see how big you want the popsicle to be. Next cut out a square piece of foam board with exacto knife. My daughter is 3 years old and I made hers 15″ x 17″. Take a rounded object and place at each top corner of foam board. Trace on the edge to create rounded edges. Use exacto knife to cut rounded edges. Measure how big you want your posterboard pieces to be. I made the orange piece 7″ tall and the other two 5″ tall. Then use your glue stick and glue on a piece at a time. I had it so they slightly overlapped. Then use scissors to cut off excess posterboard from edges. After I made this, I thought it would be fun to add a bite mark. Just make some simple curved lines on corner and cut out with exacto knife. 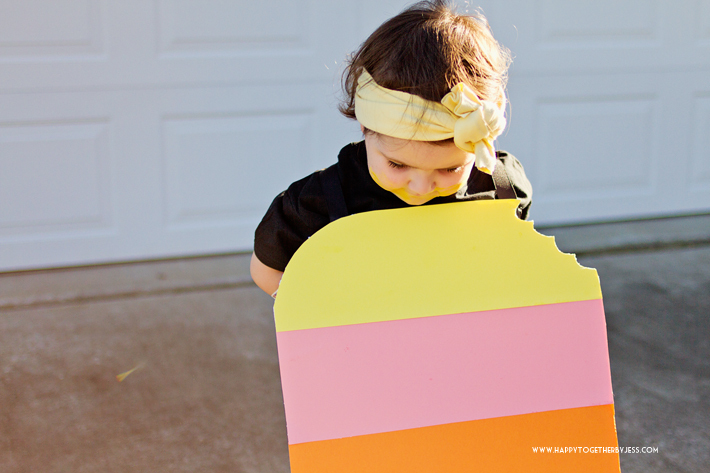 Cut out two pieces of ribbon that will be long enough to hang on shoulders of person wearing costume. Mark where you want them to sit on the foam board. Glue ribbon in place with hot glue gun. Then cut one more piece of ribbon to tie through the loops in the back (I used fabric so you could see the contrast). 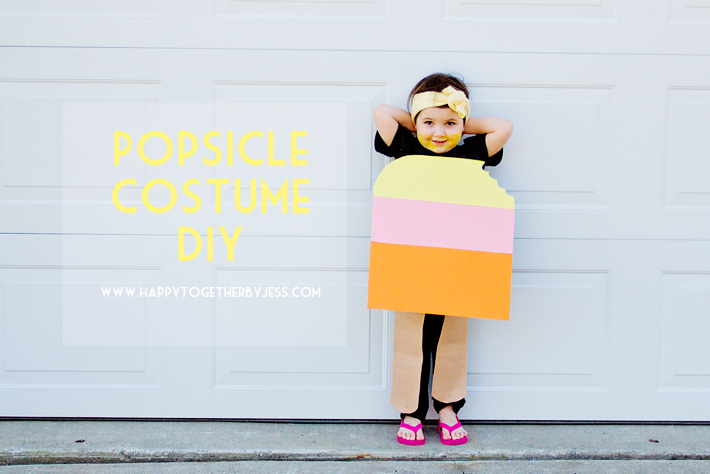 You could make two popsicle sides and use ribbon to connect them and go over shoulders, but I wanted my daughter to be able to sit down while keeping it on. I also added some yellow to her face so it looked like she was the one who took the bite out of her popsicle. I didn’t have any face paint on hand, but I found that you can mix baby lotion with cornstarch and then add natural coloring to it. I used icing gel for the color because that is all I had, but it all wiped off so nice and easily. Search for diy face paints if you want to try that. 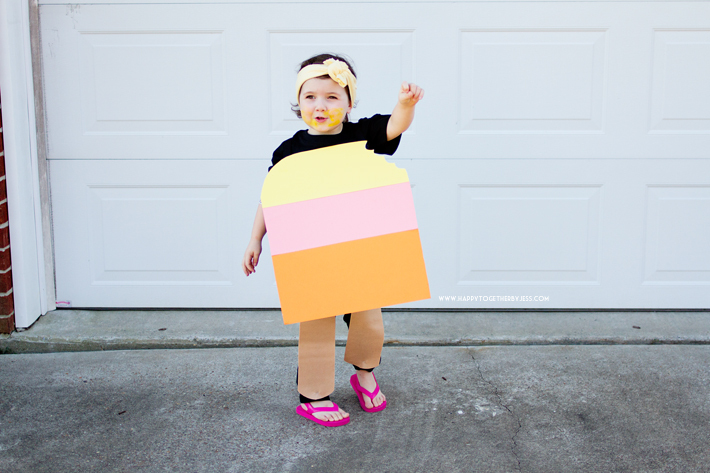 I hope you have fun creating costumes this month! This post was created in partnership with Micheals. All opinions stated are my own. Affiliate links have been used. Thank you for supporting the sponsors that support Happy Together.